We are on the move and going down south. We spent a day in Ingolstadt yesterday. If you’ve read Frankenstein then you know Ingolstadt was the setting for the story. 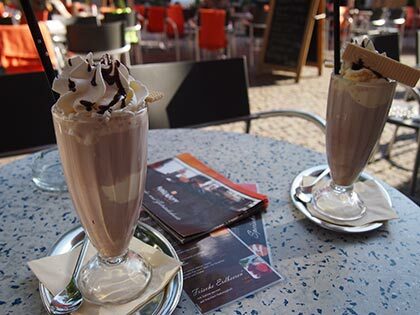 We didn’t see any strange creatures but we did find a great little cafe to enjoy some eisschokolade. Now it’s time to hit the road again. Next destination is Bolzano, Italy and then Tuscany! Yes, I’m finally going to Italy, which has been one of my dream destinations for a very long time. So I doubt I’ll be able to post anymore but when we return to Germany I’ll share more pics. Happy summer days and happy reading everyone! I am currently watching Under the Tuscan Sun, which is as close as I am going to get to Tuscany! I am just a bit jealous that you are going to get to do the real thing! Yum! It looks and sounds like you are having an amazing time. Enjoy!!! !